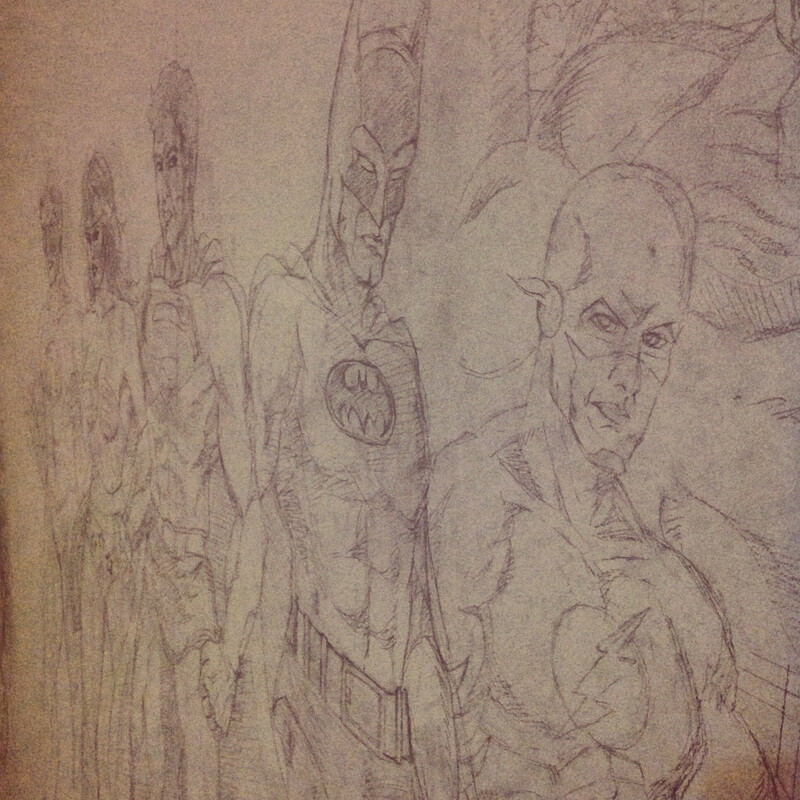 I’ve been working on a literally HUGE project these past 3 weeks–a Justice League wall mural in my cousin’s bedroom. His family’s moving to a new home and my aunt commissioned me to decorate one side of my cousin’s bedroom with comic book characters. Needless to say, it took some time to convince myself to do it because of the level of difficulty involved (In all honesty, the first thought in my head when I heard it was that it was complete madness!) but in the end, it was exactly that level of difficulty that made me agree to the proposal. The idea of a Justice League wall mural was so insanely challenging, I just had to do it to prove to myself that I CAN do it. Obviously, the main challenge was the sheer size of the wall. This is easily the biggest illustration I have ever done in my life. I drew large posters back in high school and I once helped paint a mural on one side of a school building, but those were tiny compared to the scale of this one. I did a bit of research on how murals like this are made and one thing that people always suggest is to use a projector, so you can draw the image on a regular-sized piece of paper and project it on the wall; that solves the problem of proportion–how to keep figures the proper size relative to each other even when you’re drawing them so big you can’t see the whole thing all at once unless you take a step back over and over again. 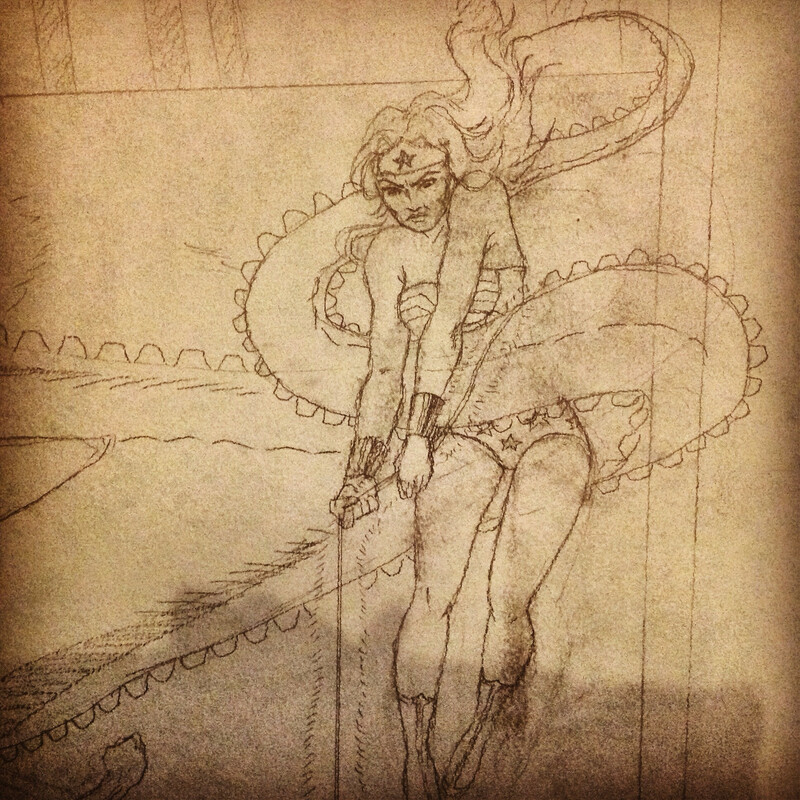 It’s hard to get a clear shot of the mural’s pencils, so I’m experimenting with different Instagram filters to make the lines pop out. I don’t have a projector. Of course, being the proud artist that I am, I didn’t let that stop me from doing the mural anyway. In fact, not having a projector and the idea of sketching directly on the wall without a guide challenged me even more to take on the task. So I bought a meter stick, packed my pencils, downloaded a bunch of Justice League references and made my trip to the wall to face what’s probably the greatest artistic challenge of my life so far. 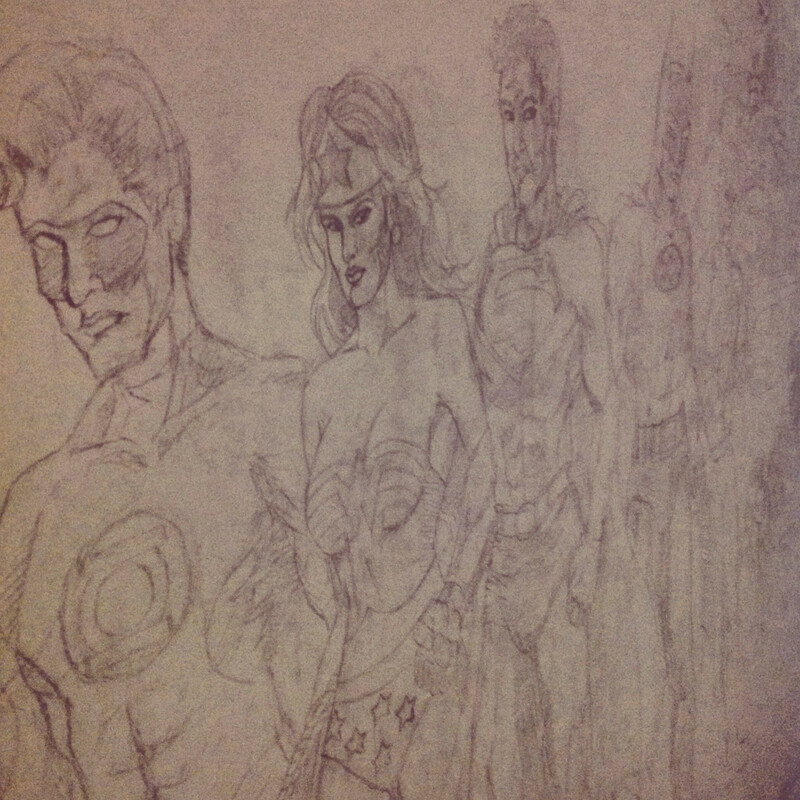 Justice League has a lot of members but I’m focusing on Superman, Batman, Wonder Woman, Green Lantern, and The Flash. 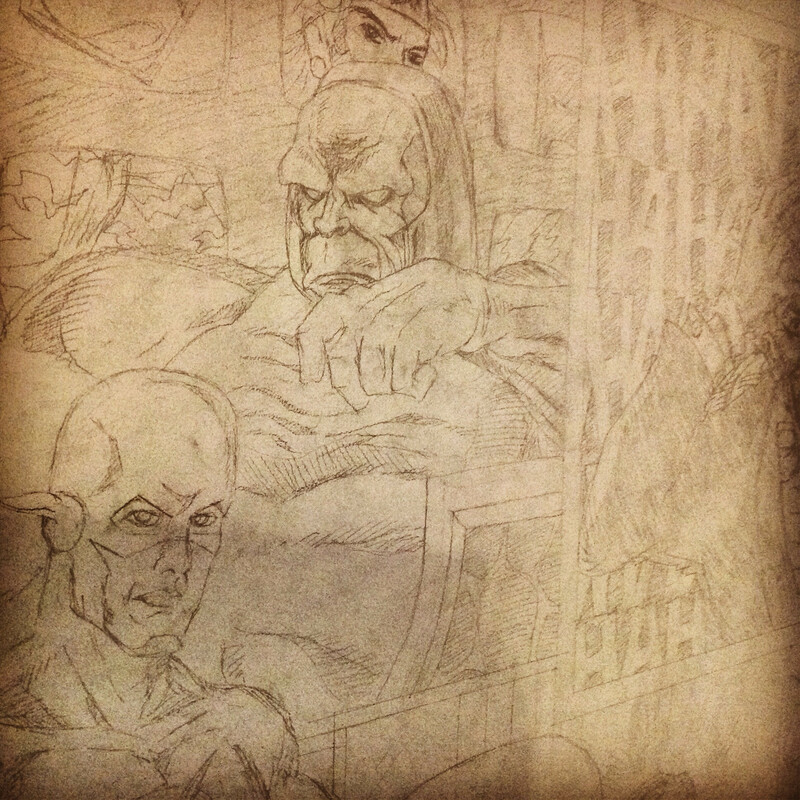 First time I saw the wall, I thought it was big, but the real enormity of it didn’t really occur to me until I was drawing Superman and I couldn’t figure out if his chest was big enough or if I should keep on broadening it. There was really no time to practice–though I could feel myself getting better as time goes by–I had to learn to adjust my style to the blown up dimensions right then and there. I’m using various references, but I’m especially looking for iconic panels, covers and villains. I found that faces were more fun to do because you have so much space to add details that you can’t otherwise draw on an A4-sized paper. The harder part is keeping characters positioned at the right angle, making sure they’re not glaringly slanted to one side or that sections of their body are not leaning toward different directions all at once. Me being averse to measuring things with rulers for a protracted period of time, I only plotted a few imprecise guide lines using my meter stick and triangle and just trusted my instincts that I was drawing lines at the correct degrees. Of course, I wasn’t. 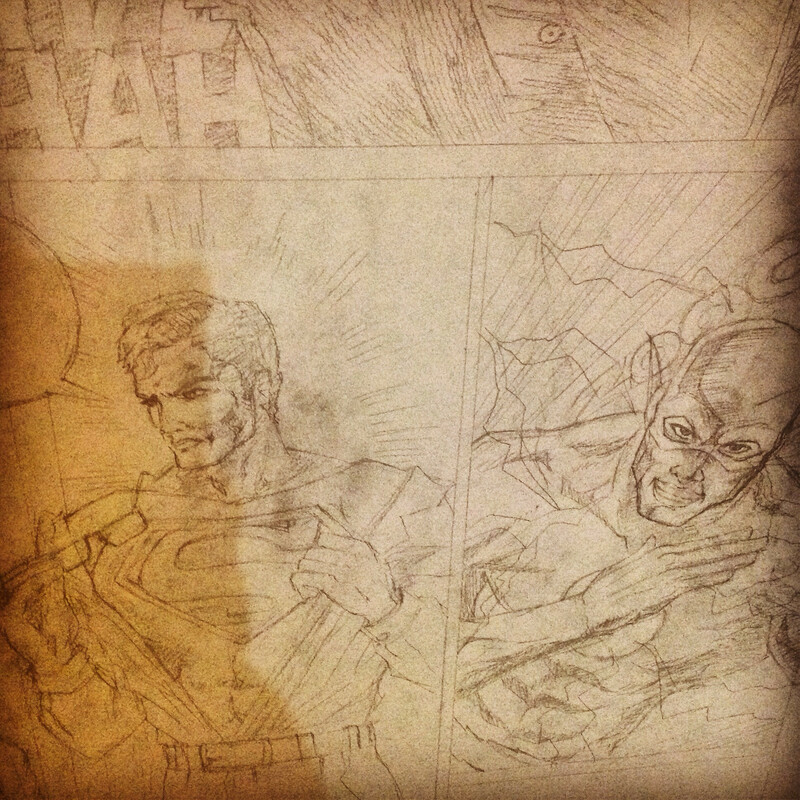 The moment I finished Superman’s head, I already realized I didn’t even get the center of the wall right–meaning, if Supes was the center of the mural, one side was going to be wider than the other. But I’m stubborn. So I committed to my initial design and hoped that I could balance the entire thing as I go along. 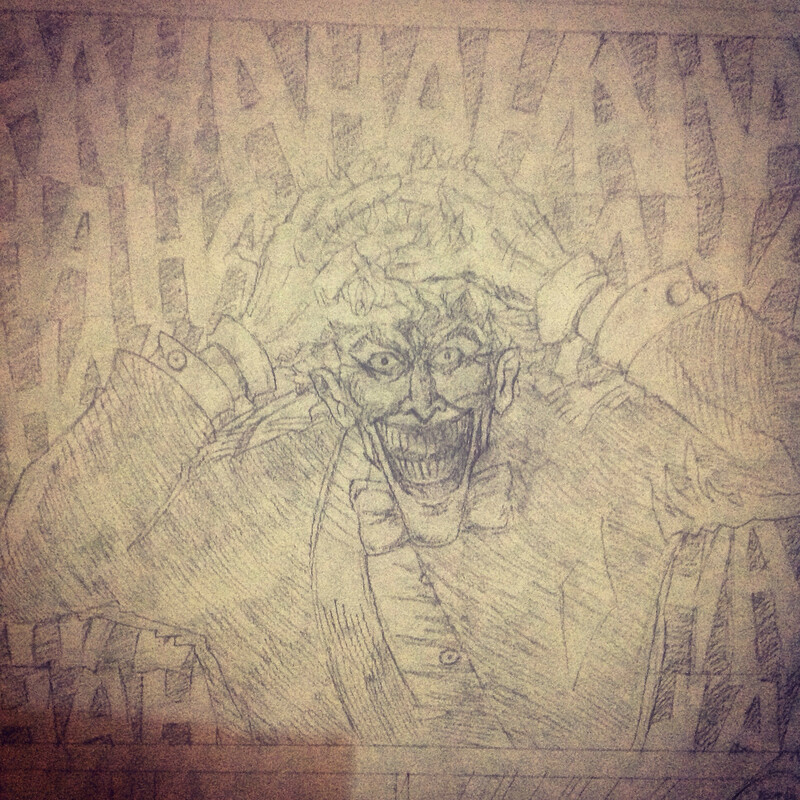 This one’s my favorite so far: my version of Bolland’s Joker from The Killing Joke. Perspective and proportion are hella frustrating. Since I can’t see the entire figure, I keep on misjudging the size of various elements. 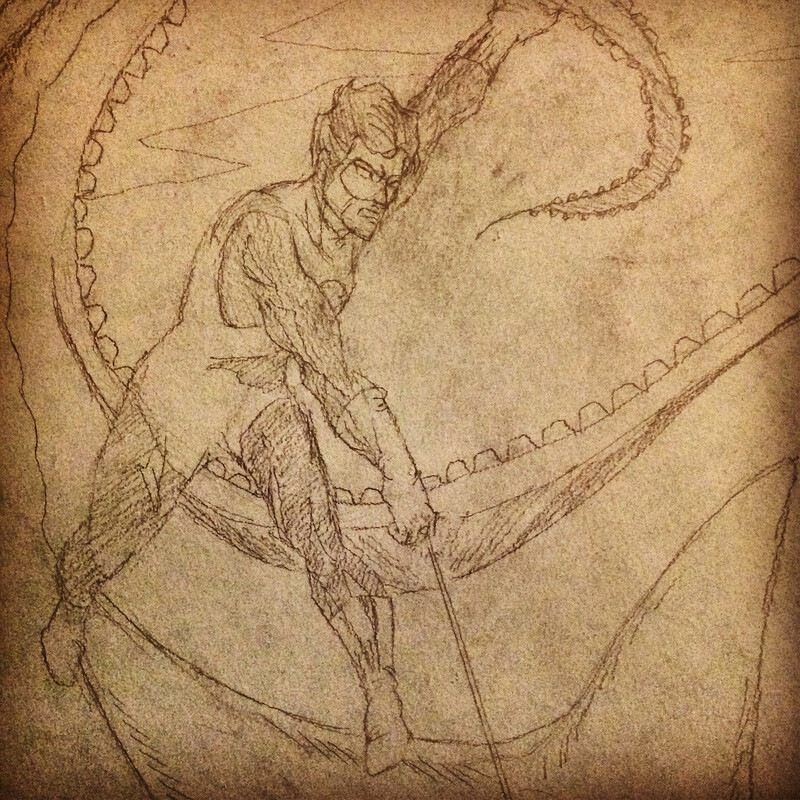 I had to erase legs so many times because they look ok if you’re looking at them standing up but when you step back and take a photo, they’re obviously wrong–either too long or too short. Things get warped depending on your point of view so you have to keep all your wits with you and really keep your senses sharp. Expect more speech bubbles and Pows and Kapows as the mural gets made! Why the Justice League and not the Avengers? Well, I don’t hate Marvel but I love DC. 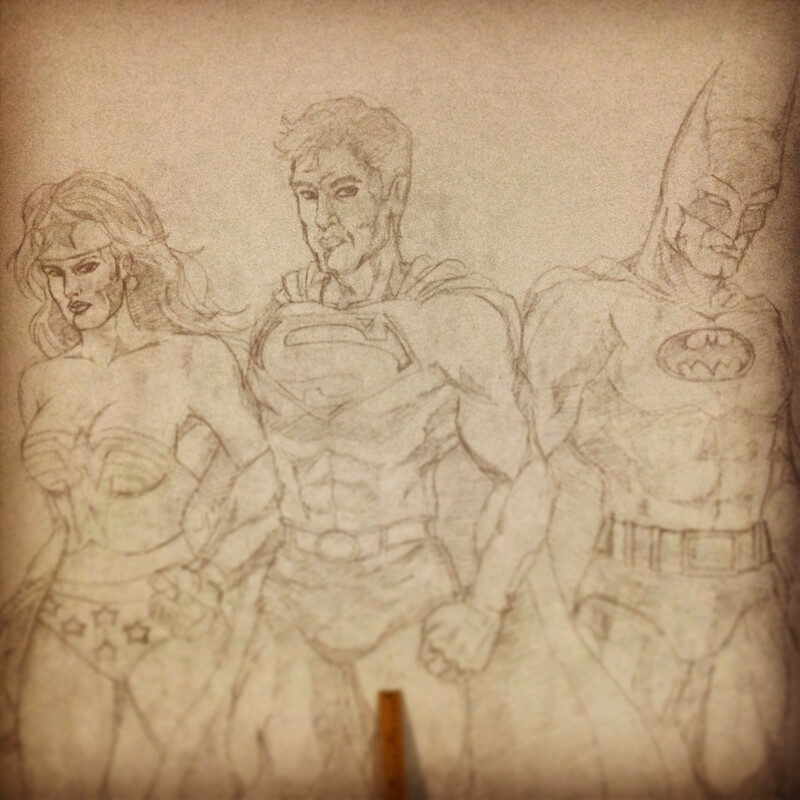 And with Superman, Batman and Wonder Woman being the classic, old-school superheroes that they are, I thought my cousin would appreciate the design more as he grows older (he’s still very young) and he realizes the scenes that I’m drawing now are actually iconic moments, not just in the DC universe, but in the comicbook genre in general. That’s also the reason why I decided to go back to Silver Age versions of JL core members or founders (though I’m quite sure I’m not period-accurate and some of them have mixed elements from different eras). How cool would it be to be staring at a giant starfish for such a long time and then realizing at some point in your life that was actually Starro the Conqueror and the panel was inspired by one of the most iconic comic book covers in history? 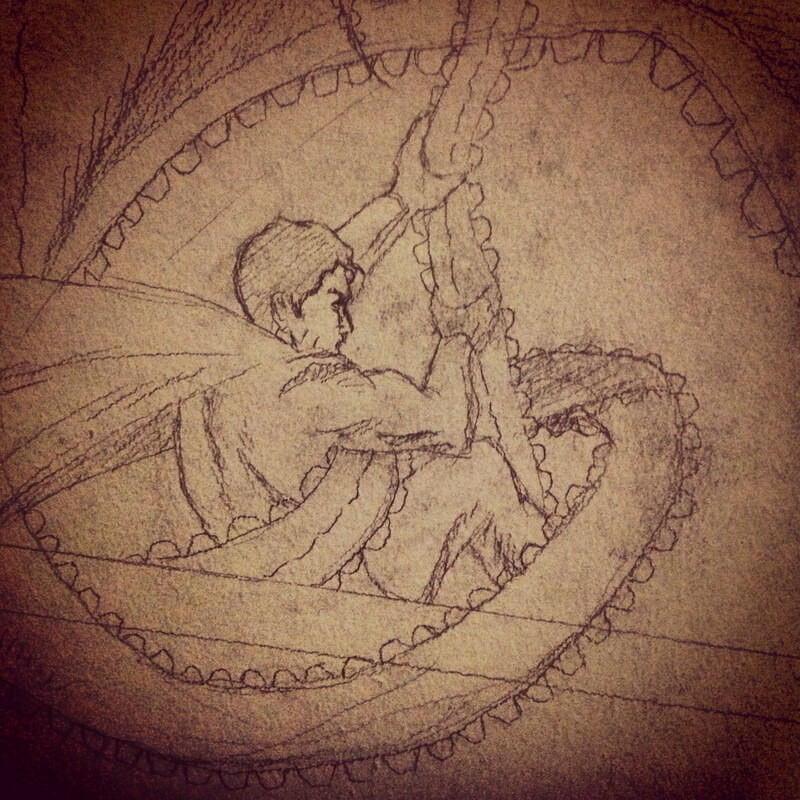 Starro the Conqueror. I replaced Aquaman with Batman and Martian Manhunter with Superman. There’s still a lot of work to be done. Truth is, though I’ve been working on this mural for the last 3 weeks, technically, I’ve only spent less than 3 days drawing everything posted here; that’s because I only go to my cousin’s house every Monday (my days off are Sundays and Mondays) and I only draw for about 4-5 hours. Still, due to the fact that I have to draw standing up with my right hand raised parallel to the wall, I definitely feel some muscle fatigue when I do it, which is actually good because I barely get enough exercise these days. About 50% of the wall is now filled up with sketches. Once the pencils are done, I will “ink” the drawing using black acrylic paint and probably markers for the tiny details that a paintbrush can’t trace over. I won’t be coloring the mural to avoid ruining it by making it look like something you’d see in a kindergarten classroom. If I pull it off, the wall should look just like a black and white comic book page with lots of fun details that should catch everyone’s attention for just a little while. Frankly, as an artist, that’s what gratifies me the most–when you can make people stop and stare. 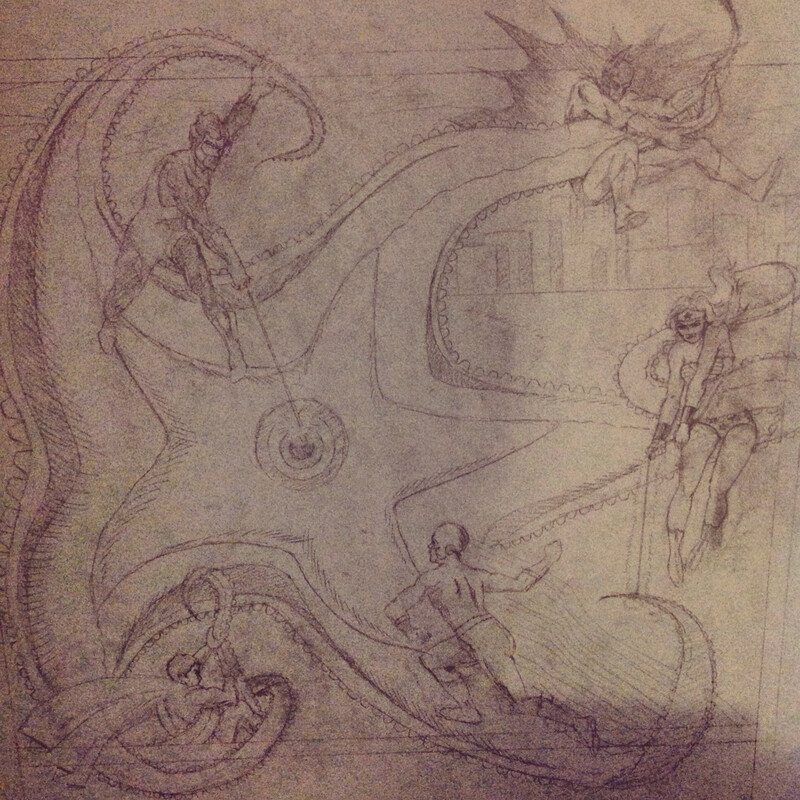 I can’t wait to ink this mural and see what it would look like when the details come alive. A few more shots. 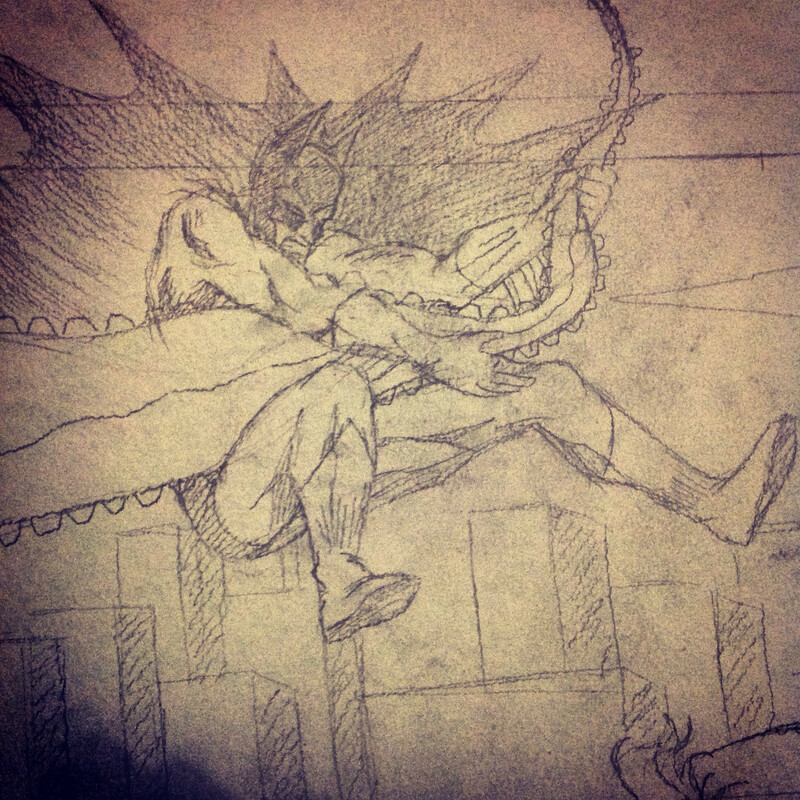 Here’s Batman vs tentacles. 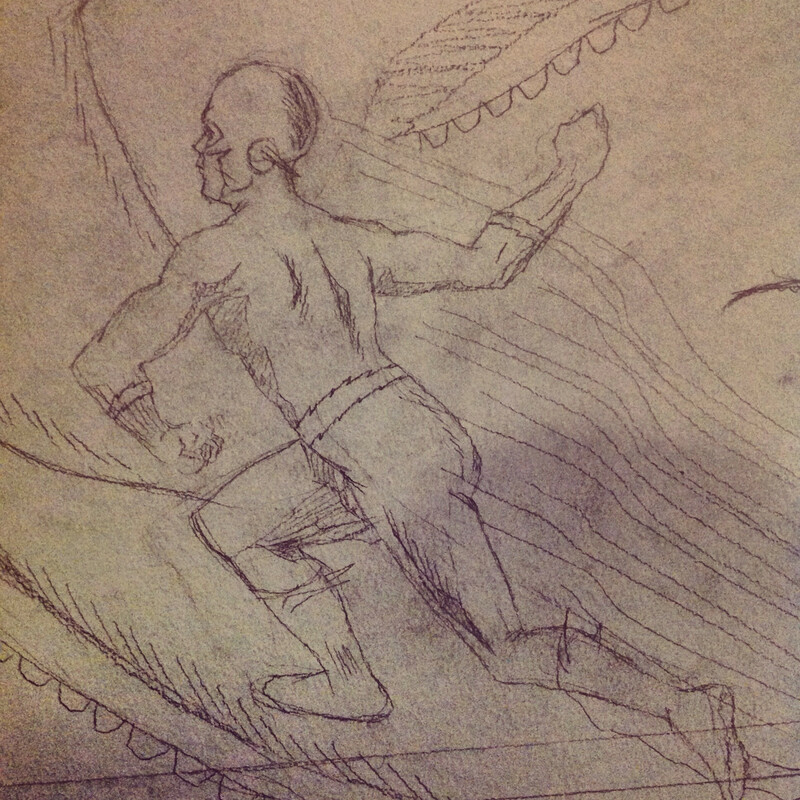 The Flash getting ready to pummel a starfish. Hmm… I should add heat vision.